“If this is a way to start a conversation, then I am excited,” says Associate Professor of Mathematics Meredith Greer. 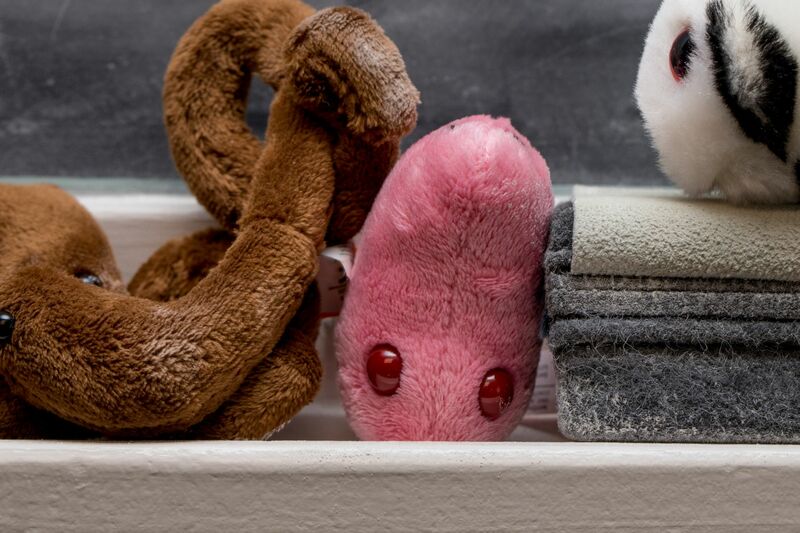 She’s talking about the assortment of oversized plush microbes in her Hathorn Hall office that reflect one of her research interests: mathematical modeling of infectious diseases. “Usually it’s how they spread through a population of people, although sometimes it’s how they reproduce and spread within a person’s body,” she says. The plush figures, from the company GIANT Microbes, remind her of projects she’s worked on over the last 20-plus years. Each a gift from her husband, Brian Pfohl, they depict different cells and organisms more than a million times their actual size. Pfohl initially purchased two. As Greer’s research or class projects shifted, he added new ones to the collection. “These cute little pink ones,” she says, “are supposed to represent the virus that caused the outbreak of what was then called swine flu,” a disease she has studied extensively with her biology colleague Karen Palin. The algae one, she says, symbolizes the cyanobacteria she’s been working on for several years with Holly Ewing in environmental studies. An Ebola microbe reminds her of her students who studied the deadly Ebola outbreak. And finally, there’s the “zombie” virus, “just making a joke about the zombie thing,” she says. Greer has taught a First Year Seminar on how one might model a zombie outbreak mathematically, an excellent way to use flow charts and modeling software to introduce students to college-level mathematics, she says. Greer hopes that students who visit her office can see a playful side of mathematics and realize that math can be helpful in surprising ways. 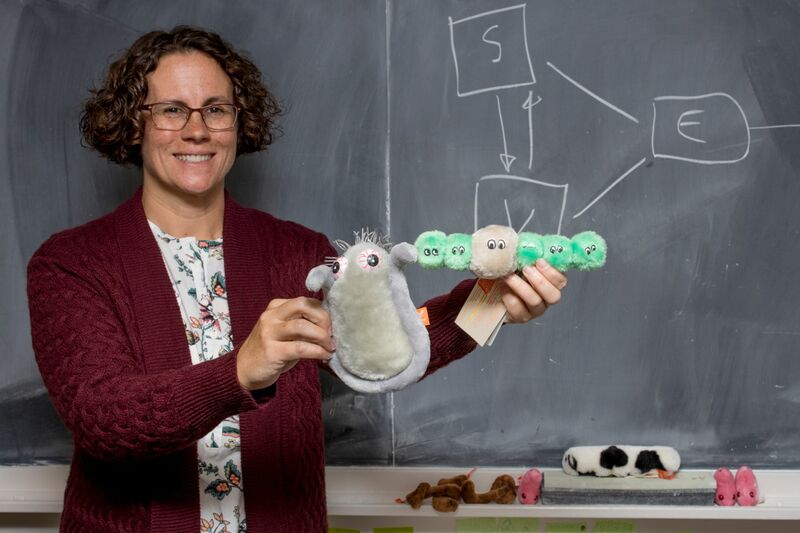 The plushies “can be fun for students who also ask questions about doing math research on disease. It’s another way to talk about it,” she says. They’ve served a more practical purpose, too. When her two daughters were younger, they provided a welcome diversion during office visits; ditto for the children of faculty colleagues or alumni who stop by her office for a visit.